RPC-087 (OL-Site-118) must be allowed to consume from Level 0 personnel while in containment at all times. On-site medical personnel is never allowed to enter the inner containment unit alone and without ASF personnel present. Level IV MOPP (CBRN) must be worn by Authority personnel at all times when inside inner containment unit. Should a MOPP breach occur, Authority Decontamination Protocol must be initiated. The medical team leader must inform Containment Specialist if Level 0 personnel is approaching death, the PPS must initiate Procurement Procedure immediately upon notification. Description: RPC-087 (OL-Site-118) is a shadow like humanoid, with no discernible features, appearance resembles black vaporous gas. At this time, it is unknown if RPC-087 is sentient or organic, and its origin is unknown. Attempts to measure mass of RPC-087 at this time have met negative results; its vertical height varies at all times. RPC-087 absorbs/consumes alpha, theta and delta brain waves (“Dreams”) from sleeping and/or unconscious victims, ongoing research is in progress to understand mechanics of how RPC-087 absorbs/consumes gross brain wave activity. The current study indicates that brain mass is lost during these events. Brain death is the result of sustained exposure to absorb/consume events. Temporary exposure to absorb/consume events results in D – Class to remain in either a vegetative or minimally conscious state. RPC-087 also exhibits physiological changes during absorbs/consume event and appears to become more solid than vaporous. When not in absorbs/consume condition, RPC-087 can envelop victims and kill in approx. ██ seconds. RPC-087 was first encountered on 10/30/1988 during the body retrieval of Mr. ███████ from Happy Home Hospice Care, located in the city of El Cajon, CA. Local law enforcement was called to investigate the sudden death of ████████ who was working for East County Mortuary picking up the deceased Mr. ███████. Preliminary autopsy reports on deceased ECPD and MST had produced inconclusive results; the bodies did not exhibit signs of trauma at the time of death. Authority personnel embedded in ███████ contacted containment units to incident site. Authority MST responded and assumed control of the incident. RPC-087 was found in the highly agitated state, killing ███████, a member of MST Alpha-5 before full containment was achieved. Upon Arrival to location, I observed (2) El Cajon PD units (#218 and #710) unoccupied with Code 3 lights activated. Unit #710 still had siren activated. I then called out 10-33 (Emergency Traffic only) radio code and requested for additional units to my location. I then observed a male subject in hospital scrubs (now know to be: ████ ███, CDL#A██████, Address: █████████, Vista, CA 92081). I initiated felony pedestrian stop, and at gun point, commanded ███ to stop and get down on his stomach. ███complied with my verbal commands and as I approached ███, Officer ███ (Badge#███), from La Mesa Police Department, approached with weapon drawn and covered me while I handcuffed ███. Officer ███ and I moved ███ to a covered position behind my vehicle and conducted physical search of ███. ███ was hysterical and screaming “He’s killing them! Stop him please!” .Officer ███ made several attempts to calm ███ down to ascertain suspect information but was unsuccessful. Additional units began to arrive from multiple agencies and set up perimeter of location. Incident Commander ███ (Badge#███) arrived on scene and activated the Command Center and initiated Mutual Aid. Officers ███ (Badge#███), ███d (Badge#███) and I made entry from southeast doors located along Desha Road. ███ was immediately hit by suspect and dragged into Room #██ and we heard a struggle ensue. ███ and I immediately approached the door with intent to engage suspect with deadly force. At this time, we observed Officer ███ on the floor, on his back and speaking incoherently, we called for extrication team and EMS to respond to southeast entrance. Officer ███ and I swept the room and did not locate suspect, we both observed dark gaseous type vapor towards back of the room but did not make any further attempts to investigate. I radioed Incident Commander to report possible HAZMAT in area and that source of gas was possibly venting from cylinders present in room. Incident Commander directed Officers to stop forward progress and establish perimeters at current positions. At approx. 1813hrs, armed personnel identified as San Diego County Sheriff Department, wearing HAZMAT suits made entry from southeast entrance. At 2022hrs suspect was reported in custody and Code 4 was announced, local units were instructed to go 10-7 (Back in Service) and 10-34 (Resume normal radio traffic) was announced. San Diego County Sheriff Department assumed perimeter security and initiated lock down of Happy Home Hospice Care. Narrative: On 10/30/88, at 1813Hrs, MST Alpha-5 (A-5), Delta -3 (D-3) responded to target location and initiated capture and contain mission. D-3 (in Level IV MOPP) entered target building with A-5 as fire support. 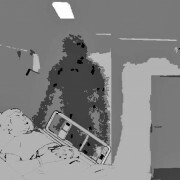 RPC-087 was cornered in Room #66; D-3 entered and immediately came under strong attack. A-5 deployed ██████ Containment Weapon and was unsuccessful. D-3 deployed ██████ Containment Weapon and made partial containment. A-5 pushed further into target area and came under attack. Partial containment failed and A-5 sustained KIA, Containment Weapons Specialist ████ ████ was shrouded by RPC-087 for approx. 10 seconds and fell to the ground. D-3 was able to re-establish partial containment but suffered KIA, Specialist ██████ ██ was fatally struck by friendly fire from A-5. A-5 Specialist ████ ████ redeployed ██████ Containment Weapon dropped by CWS ██. D-3 deployed EMF containment unit and full containment was achieved at approx. 2022 hrs. A-5 continued security sweep and established full control of target location. D-3 escorted RPC-087 to MST-Aviation Support Base-Pinal for extraction to containment SITE-118.